Real estate is one of the most difficult investment platforms to get on to, besides the higher capital you will probably need compared to most other investment opportunities, it also requires you know understand what you are doing and be a smart schemer, not just a hard worker. Luckily, if you have an open mind and have what it takes, a lot of material to educate and guide you on how to invest in real estate are easily accessible today. You cannot just go online and read tips on real estate investments, remember anyone can post anything on the internet. You cannot go wrong buying a book though. Telling apart valuable real estate investing books from the worthless ones can be very difficult but to get you started here are 2 great real estate investment books you will find invaluable. This is among the most talked about yet very difficult to find real estate investment books today. 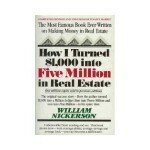 Even if you are not into reading that much, you will find ‘How I turned $1,000 into $5 Million in Real Estate in my Spare Time’ not only fun to read but also inspiring because William Nickerson tells his true story of persistence, hard work, planning and best of all, the believe in oneself. By following a simplified hybrid investment model that the writer used, you can also have an opportunity to move from being nothing to a millionaire by adopting his ‘buy low, rent then trade up to a bigger property’ model or come up with your own. Because it is one of the older books, William Nickerson’s real estate investment true story publication highlights some specific methods that investors can use but it still focuses on ‘trading’ in property, something that doesn’t happen today. However, every success begins with a solid foundation, and the best way to come up with effective strategies of the future is learning from those of the past. Recommended for Beginners, Intermediate and Advanced real estate investors. Tony Alvarez is a very successful real estate investor and most people who know him also say he is a wonderful and easy to talk to person. Perhaps these three qualities, all manifested in the ‘Breaking into the REO Business’ book, makes it one of the best real estate books you will ever read. The full review of the book is on his website www.tonyalvarez.com and it focuses on giving you a roadmap plan that will help you become an investor without all the mumbo jumbo and fluff that most writers use to make a book big. 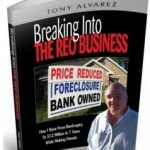 ‘Breaking into the REO Business’ is simple and straight forward, even a small child can understand what the author was communicating. Tony will lead you on a mental trip to make you understand how he made a fortune selling lender owned foreclosure properties, how he identified his niche and how you too can recognize where your opportunities lie.